AP Govt Dasara Holidays 2018: AP Government has Declared Vijaya dashami or Dasara Holidays to Schools and Colleges From October 9 to October 21, 2018. Total 13 days Vacations Holidays Announced on the Eve of Dussehra (Dasara). The Andhra Pradesh state government has said good news for all students. The government ordered all public and private schools in the state to consider Dasara holidays from October 9 to 21. Again all schools and colleges are going to work from 22nd October 2018. విద్యార్థులకు రాష్ట్ర ప్రభుత్వం శుభవార్త చెప్పింది. రాష్ట్రంలోని అన్ని ప్రభుత్వ, ప్రైవేటు పాఠశాలలకు అక్టోబరు 9 నుంచి 21వ తేదీ వరకు దసరా సెలవులుగా పరిగణించాలని ప్రభుత్వం ఆదేశించింది. 21న ఆదివారం సెలవు కావడంతో పాఠశాలలు 22 నుంచి పనిచేయాలని పేర్కొంది. Vijayadashami also known as Dasara, Dusshera or Dussehra is a major Hindu festival celebrated at the end of Navratri every year. It is observed on the tenth day in the Hindu calendar month of Ashvin, the seventh month of the Hindu Luni-Solar Calendar, which typically falls in the Gregorian months of September and October. This year Dasara Celebrates on Friday, 19 October 2018. Note : The Holidays are declared by Andhra Pradesh Government to All Educational Institutions Which are in AP. JNTUK, JNTUH, JNTUA Universities Not Yet Announced Dasara Holidays Notification. So, Stay Tuned For Official Notification. 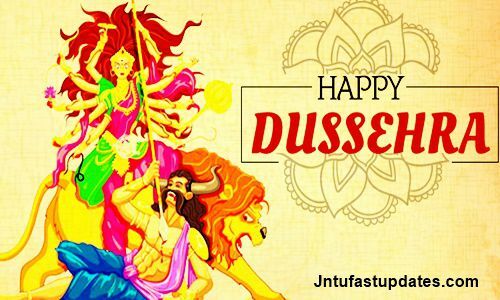 Jntua Dussera holidays from when?